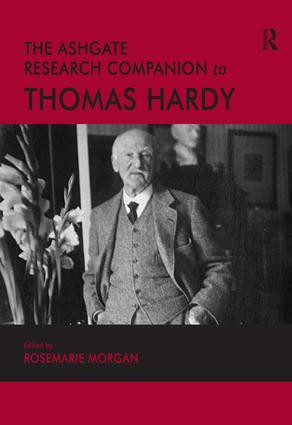 In The Ashgate Research Companion to Thomas Hardy, some of the most prominent Hardy specialists working today offer an overview of Hardy scholarship and suggest new directions in Hardy studies. The contributors cover virtually every area relevant to Hardy's fiction and poetry, including philosophy, palaeontology, biography, science, film, popular culture, beliefs, gender, music, masculinity, tragedy, topography, psychology, metaphysics, illustration, bibliographical studies and contemporary response. While several collections have surveyed the Hardy landscape, no previous volume has been composed especially for scholars and advanced graduate students. This companion is specially designed to aid original research on Hardy and serve as the critical basis for Hardy studies in the new millennium. Among the features are a comprehensive bibliography that includes not only works in English but, in acknowledgment of Hardy's explosion in popularity around the world, also works in languages other than English. Rosemarie Morgan is an Honorary Senior Research Fellow at St Andrews University, UK. She is President of The Thomas Hardy Association, Vice President of the Thomas Hardy Society, and Editor of the biannual Hardy Review. Among her publications are Cancelled Words: Rediscovering Thomas Hardy (1999) and Student Companion to Thomas Hardy (2006).